Hand analysis is invaluable for improving forecasting skills. These days paper analysis tools can be hard to come by, so we are providing reusable ones. We will be expanding this product line, so check back soon. *Note: If you are ordering more than 2 Weathergraphs at once of any type(s), please contact us for a reduced quote on shipping. The skew-T log-P diagram is commonly used to plot the temperature and dewpoint data obtained from soundings. It provides a convenient way to visually estimate thermodynamic quantities vital to forecasting severe weather, winter precipitation type, and many other important applications. This full color diagram works with dry or wet-erase markers so you can use it over and over! 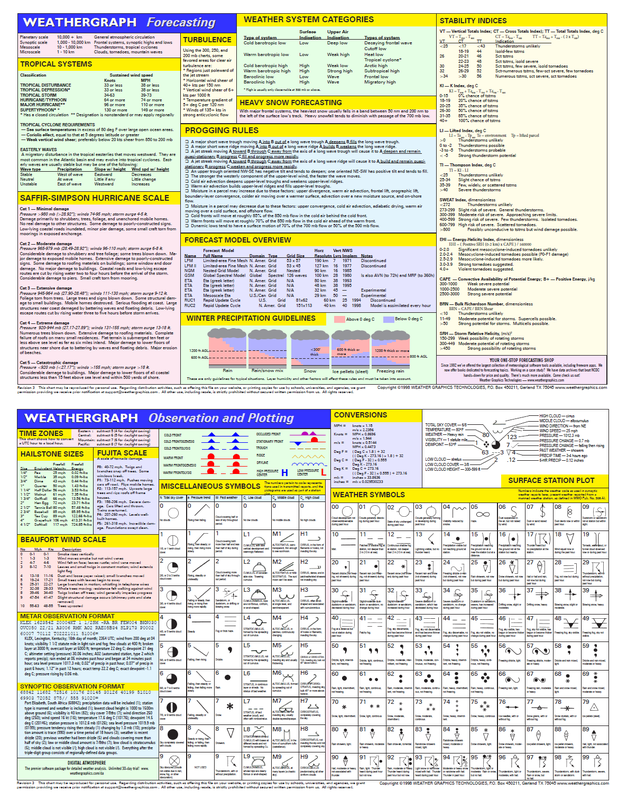 On the reverse is a reference chart explaining the elements of the skew-T diagram, as well as a list of severe weather indices often computed using these diagrams and their meanings. For more in depth information about meteorological thermodynamics, check out our Instability, Skew-T & Hodograph Handbook. $13.95, 11 x 17 inches, double sided laminated cardstock. 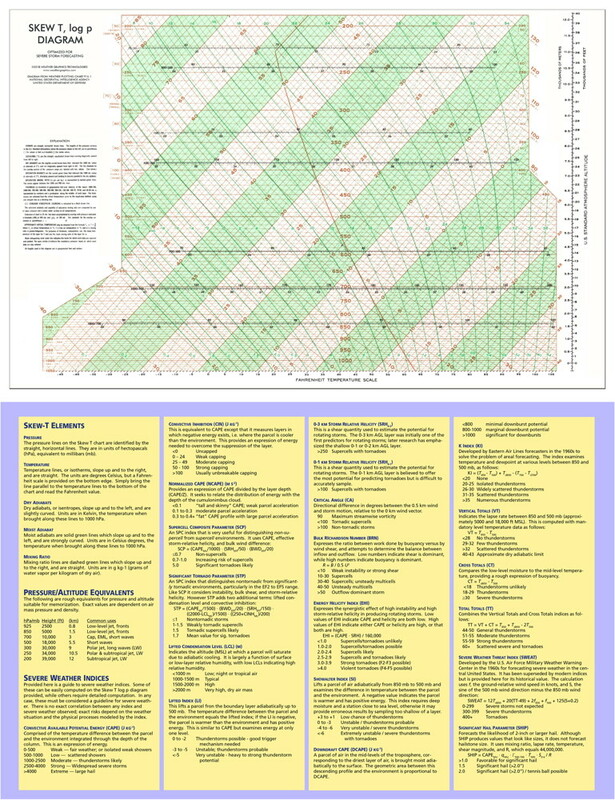 The original Weathergraph is a handy reference for forecasters and hobbyists alike. On one side is a wealth of information useful in producing and interpreting forecasts. The reverse is focused on observations and plotting. Click on the image to the left for a larger view to see exactly what is included in this reference tool. Please note the Fujita and Saffir-Simpson scales shown on this product are the original versions. We will be updating this with the 2007/2012 scales respectively soon. $12.95, 11 x 17 inches, double sided laminated cardstock.